Aprille Ericsson-Jackson – African American History Month 2019 #BlackHistoryMonth « Adafruit Industries – Makers, hackers, artists, designers and engineers! Born in the Bed-Stuy neighborhood of Brooklyn, Aprille Ericsson-Jackson went on to attend MIT, and eventually Howard University, where she became the first woman to earn her Ph.D. in Mechanical Engineering (Aeropspace). 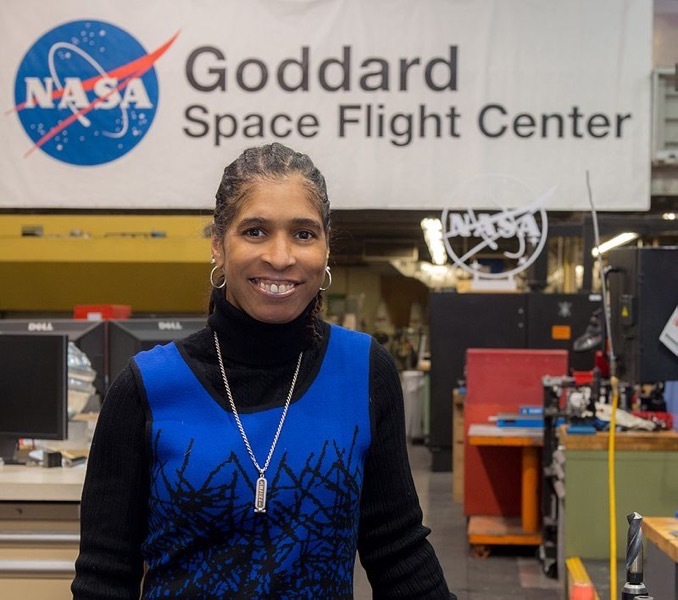 After completing her degree, she went on to work at the NASA Goddard Space Flight Center. She continues working at NASA today. Today we celebrate her exceptional career! Her NASA career started as an aerospace engineer in the Robotics group, but soon after, she transferred into the Guidance Navigation & Control discipline. Ericsson’s expertise was used to manage the spacecraft’s orientation and position during most phases of a mission. Using computers, she calculated and simulated structural vibrations, thrusting scenarios and environmental disturbances. In 2006, she collaborated on the “Mars Scout” proposal called “SCIM,” a proposed sample and return mission to Mars, serving as a manager for the Dust collector Experiment (DuCE) which proposed sterilization and stowage of trapped dust particles from the Martian lower atmosphere for delivery to Earth. From 2007 to 2008, she served as an Instrument Engineer, supporting the development of two flight instruments (ST8 Miniature Thermal Loop Heat Pipe, a technology development and, Lunar Orbiter Laser Altimeter (LOLA), an instrument on the Lunar Reconnaissance Orbiter during their integration and testing periods. The LOLA instrument was successfully launched on June 18, 2009.